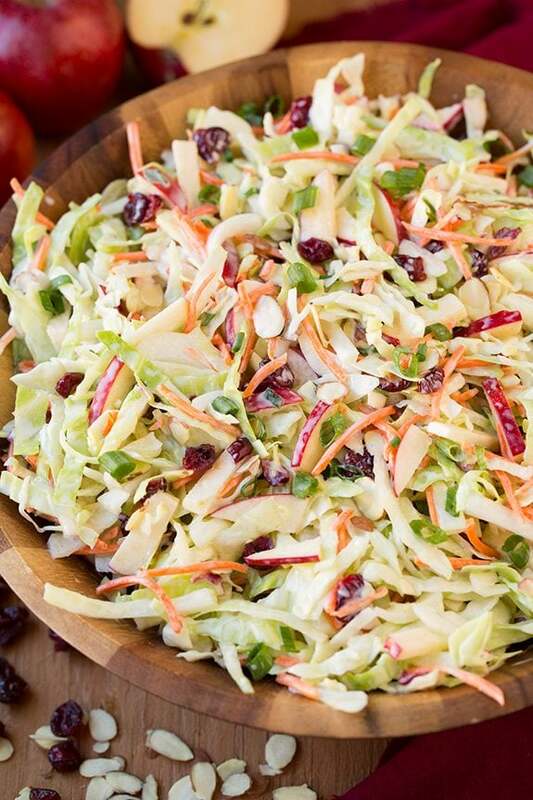 Crunchy, fresh and delicious, this Cranberry Almond Apple Slaw is the perfect side for BBQ’s, parties or picnics. Made with a simple, tangy homemade dressing and so easy to adapt with your favorite flavors, you can’t go wrong! 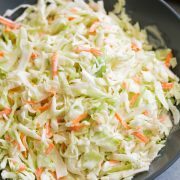 Who doesn’t love coleslaw? It’s crunchy, it’s creamy, it’s slightly sweet, and it goes with just about anything, plus it always has me heading back and heaping another generous scoop onto my plate (no shame, it’s cabbage). 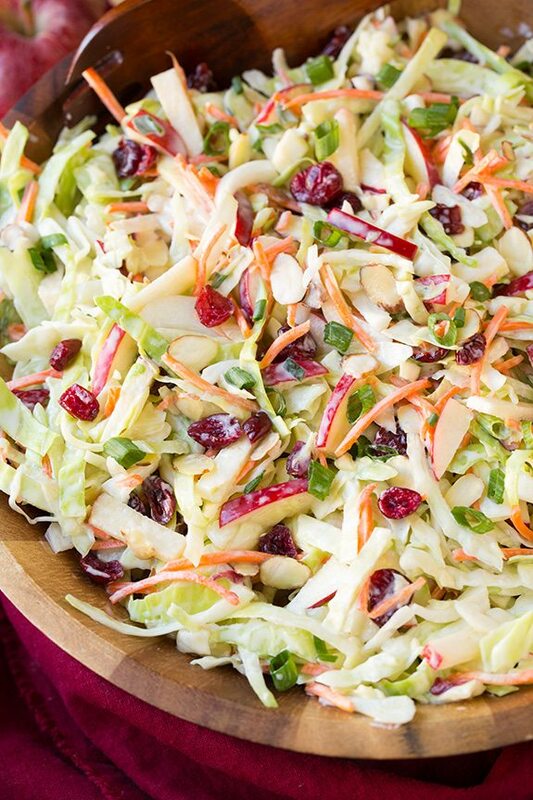 Here, you get the perfect creamy coleslaw with the addition of apples, cranberries and almonds. 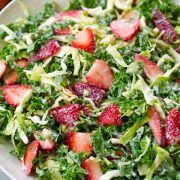 It’s covered in a lighter Greek yogurt dressing (versus a classic coleslaw dressing that has as much as a cup of mayonnaise in it). 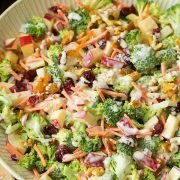 This Cranberry, Almond and Apple Coleslaw recipe has a mild flavor to it, but if you’d like a more pronounced flavor you can definitely add in a tablespoon or two of Dijon mustard to the dressing. And if you want to skip a step, you can use a coleslaw mix in place of the shredded cabbage and carrots. I think it’s time for pulled pork or pulled chicken sandwiches this week for dinner, don’t you? And then of course this homemade coleslaw to go with it! Whisk together coleslaw dressing ingredients in liquid measuring cup. Toss everything together in a large bowl and serve immediately. Can I Use Another Dried Fruit Instead of Cranberries? 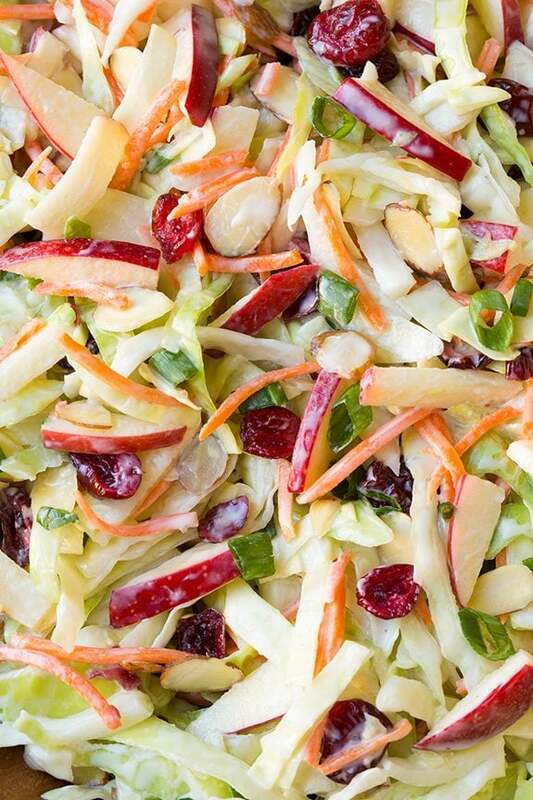 Yes, feel free to use any dried fruit in this coleslaw recipe. Just make sure to dice the dried fruit if you’re using larger fruit pieces (like dried dates or apples). Also, depending on how sweet the dried fruit is in comparison to dried cranberries you may need to add more or less honey to balance out all the flavors. If you’re short on time, you can use a bag of pre-made coleslaw mix instead of shredding the cabbage yourself. You’ll want to use unsweetened Greek yogurt in this recipe. Coleslaw leftovers will keep for a few days in the fridge, but this creamy coleslaw is best enjoyed right away. 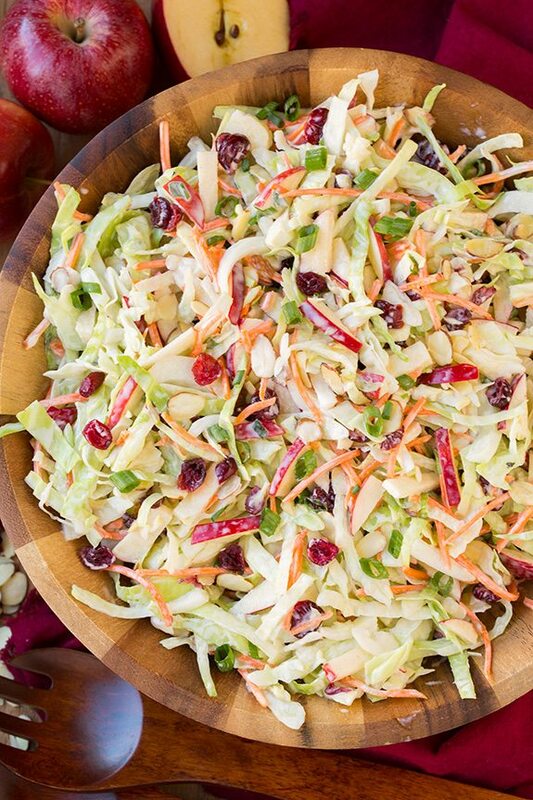 Crunchy, fresh and delicious, this Apple Cranberry and Almond Coleslaw is the perfect side for BBQ's, parties or picnics. Made with a simple, tangy homemade dressing and so easy to adapt with your favorite flavors, you can't go wrong! You'll want to use unsweetened Greek yogurt in this recipe. Corina: Substituted medium firm organic tofu for the yogurt. Used a blender instead of whisk. Found it a bit too sweet so will reduce the amount of honey next time.